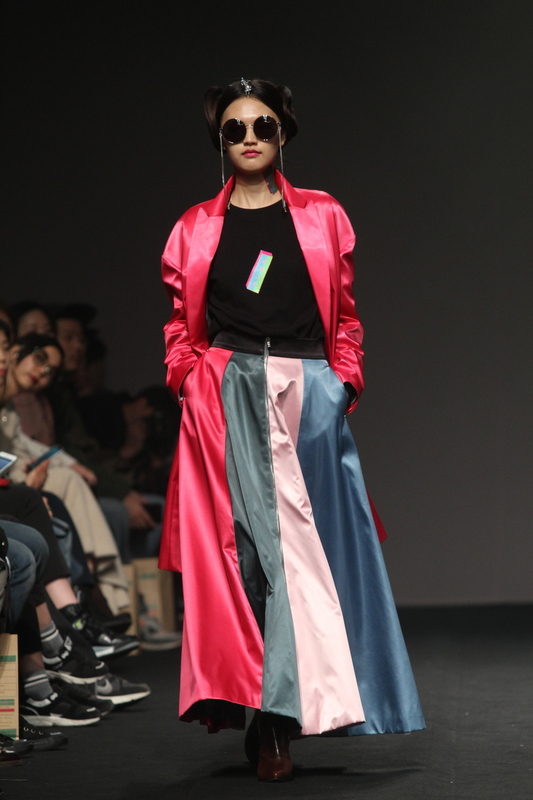 Seoul Fashion Week Fall/Winter 2015 closed nearly a month ago and Elizabeth Royal, has taken the time to look through the collections, trends, moments, and media that emerged this season and recap the most memorable parts of this year’s event. Seoul Fashion Week’s strides towards becoming a fashion week that can compete on an international level has never been clearer than Fall/Winter 15. 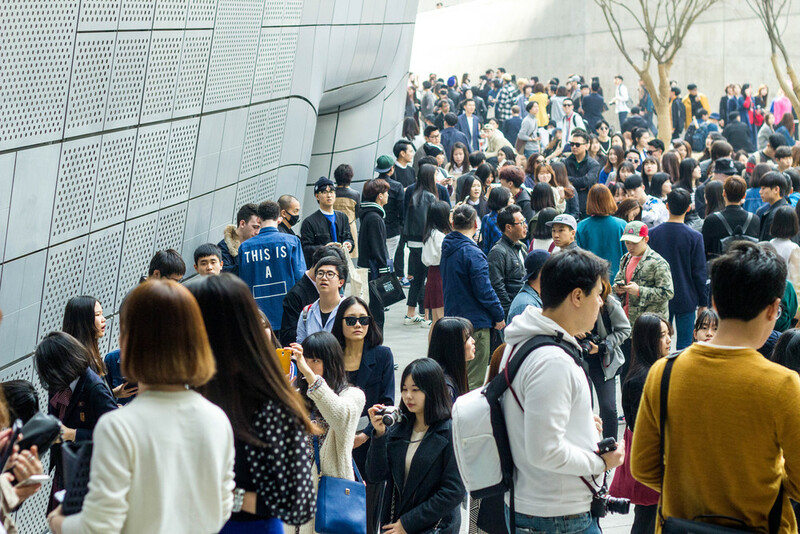 Seoul Fashion Week’s home is the Dongdaemun Design Plaza which started out out as a controversial build but is now an institution and an accessible venue. 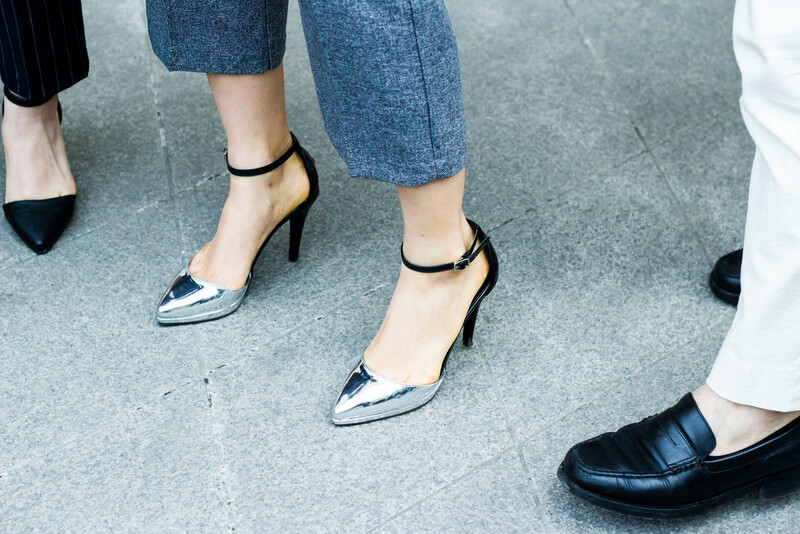 At times it seems a bit like a fishbowl that contains everything in a tidy Korean way — step outside the plaza and you might not know fashion week was going on, save for the exceptionally well dressed individuals waiting at crosswalks in impossible shoes. This year's Seoul Fashion Week held shows in three different venues within the plaza and show goers, models, and the crowd alike ran from one stage to another. Like any self respecting fashion week, half the show was outside the tent and venues. Hordes of street style photographers sat at the intersection between the decorative planters that create crisscrossing pathways through the Design Plaza. The planters were still filled with yellow winter grass because it was too early to hold flowers but you would hardly notice this - the edges were lined with hundreds of show goers in their fashion week finest, taking a break from the milieu and they themselves almost seemed like the first spring flowers here in Seoul. The crowd trickled in around 11:00 AM, though most of the street style photographers, models, and press had been there since 10:00 or earlier. The photographers knew that some of the the best shots are when the venue is clear and the models are arriving for their first calls. As the day wore on the venue got more and more crowded, and show ticket holders or people simply there to watch the spectacle arrived. People with their cell phones trying to get pictures of their favorite celebrities and models elbowed for space against the street style and press photographers who were trying to meet quota for clients. You could tell when another celebrity, model, or well known blogger had walked into the fishbowl by the frantic screams of surprise echoing from one direction or another. Inside the tent and venues it was a less chaotic story. There were congenial, orderly queues and fashion fans, students, press, media, bloggers, and even the families of designers and brand staffers that stood in line together waiting to go in. Ample staff made the seating easy, and they truly tried to get everyone in, packing some shows to standing room or seating people on the stairs after the seats in the bleachers were full. Similar to the show outside, it was packed with a mix of Korean and foreign street wear brands, couturier level fashion, men and women in perfectly tailored suiting that referenced classic Italian ateliers, design students in their own creations, and modern Hanbok presenting loudly but with absolute decorum, and the venues held something for everyone regardless of taste and preference. Overall, Korean design is not in a bubble. For the past few years, there has been increasing attention given to Korean cosmetics, culture, music, and of course, fashion. Subsequently, it’s no surprise that Korean designers are both influenced by and hold the possibilities to influence fashion around the world. Many of the collections are in their second and third decades, and have held a stream of consistent work. Now that the world’s attention is on Korea they are showing the rest of the world fully formed, mature clothing with excellent tailoring, branding, and styling gained by years of experience in their home country and parts of Asia. They have never been more ready to get the world’s attention and are emerging on the global fashion scene and markets having already hit their stride. As we wrap up the Fall/Winter seasons (Seoul comes late on the International Fall/Winter Schedule) and head into the cherry blossom covered spring in Seoul, we’ve been able to take the time to critically assess what we saw at Seoul Fashion Week’s Fall/Winter Shows and hand pick a few of the most interesting designers that were shown. Just as the Seoul girl is polished and impeccably presented, there is a crispness in women’s tailoring and styling at Seoul Fashion Week regardless of designer and theme. Whether it was Paul & Alice’s mixed plaids, oversized but tailored coats, and 1970s inspired pointed collars or Doii’s jackets in luxurious furs, feathers, and shearlings that harkened back to a multitude of eras and influences, everything was just so put together. Trends coming out of Seoul Fashion Week mirrored, on a certain scale and certainly on the designers’s own terms, trends that have been referenced by fashion weeks and collections around the world for Fall/Winter. We saw wide legged pants and alternate shapes emerging again after years of the skinny jeans, pencil fit trousers, and overly distressed denim. The Centaur sent models down the runway in ultra wide pants featuring old school glamour reminiscent of vintage satin pajama pants that flowed beautifully. Sono DRS played with a jodipur-like shape as well as wider cropped trousers. Alternately, this collection presented a midi length skirt in a variety of fabrics and textures that pegged in as an alternate to the A-line skirts that are proliferating this season. Simplicity reigned in quite a few of the collections. Known for its minimalist and incredibly detailed craftsmanship, Low Classic, a Korean brand that routinely receives international attention, presented its “handmade” collection. Contrary to the craft fair feel that usually accompanies “handmade” labels, Low Classic’s collection included classically inspired embroidery on skirts and its now signature perfect tailoring on coats that discarded buttons in lieu of the Low Classic stickpins that held them closed. Menswear and suiting is always taken very seriously at SFW, with several global menswear leaders like Gianni Fontana and Alessandro Squarzi making appearances alongside the panel of gorgeously dressed men and women from Gangnam based custom suit makers Bella Uomo. Menswear influences paralleled the women’s wear with nods towards the best of bygone eras. Suit maker and tailor Kimseoryong sent modern Kerouacs down the runway, complete with double-breasted suits in luxe fabrics, wide trousers, and the occasional beret. Both Heich es Heich’s male and female models were draped in pinstriped double-breasted suits that continued the dialogue of elegant old world suiting that we saw this season. The overall silhouette was pulled together by the attention to detail and experimentation in classic suiting. Details like a back suit coat seam that was split almost to the neckline and loafers emblazoned with the brand’s razor blade logos were seen and were tethered to elegance by the clear tailoring and absolute luxury fabrics. Caruso is an established brand here in Korea and is now in its third decade of presentation. The brand showcased perfect suits in bright colors that was a welcome divergence from the monochrome suiting that we saw so much of this season. They sent vivid suits, knits, and overcoats in shades of white, blue, burgundy and black with pops of turquoise, yellow, and red down the runway. The looks featured new takes on classic layering with coats and sweaters of varying lengths settled under boxy overcoats in heavy wools. The majority of Caruso’s collection featured the wide flowing suiting but he continued to send a few looks down the runway with the cropped, pegged trousers and fitted double breasted suit for those who are not quite ready to discard that look yet. Seoul Fashion Week has grown and embedded itself as a destination on the post-fashion month calendar, and has provided space for its emerging designers with the Generation Next category. Less established designers are able to showcase their collections alongside the more senior collections, in the same space and often with the same ceremony and circumstance. 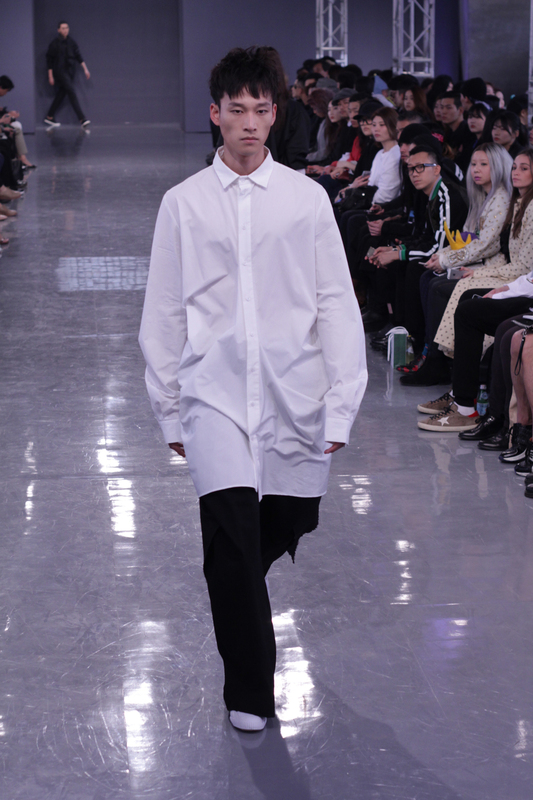 Standout designer Byungmun SEO, whose clothes were recently worn by K-pop band EXO for their Overdose promotions, sent his strong unisex designs down the runway on a set of international and Korean models. His bold and monochrome knitwear designs were draped over loose trousers and under leather jackets. Both the female and male silhouettes were assertive; it’s easy to see why the clothes would be able to stand out in an arena concert and were chosen by EXO’s stylists. It’s not surprising either, that some of the emerging designers at Seoul Fashion Week have their eyes set on the global market as well. Many of them have showrooms and workshops here in Seoul but also stock their collections elsewhere. Designer MOOHONG, who received his PhD in Political Science from The University of Warwick, has stores carrying his collections in six countries including France, Italy, and The United States. This season’s gentle collection of columnar silhouettes, shown to soothing music on understated models left the show goer feeling calm and centered. His clothes, designed for both men and women, used space outside the form of the body in a completely unique way, deconstructing and then cantilevering the form outward while still retaining the original drape and movement of the monochromatic fabrics. Munsoo Kwon’s quirky collection entitled Cant Sleep, Count Sheep subtly reminded us all of the sleep we weren’t getting during fashion week. The designer, who has previously worked with Helmut Lang and Thom Brown, also embraced the baggier suit in oversized pinstripes and a cropped silhouette, but paired varsity jackets, sweaters, and overcoats in a variety of materials and textures like shearling, knits, and even wool houndstooth and succeeded in making the collection both academic and playful all at once. 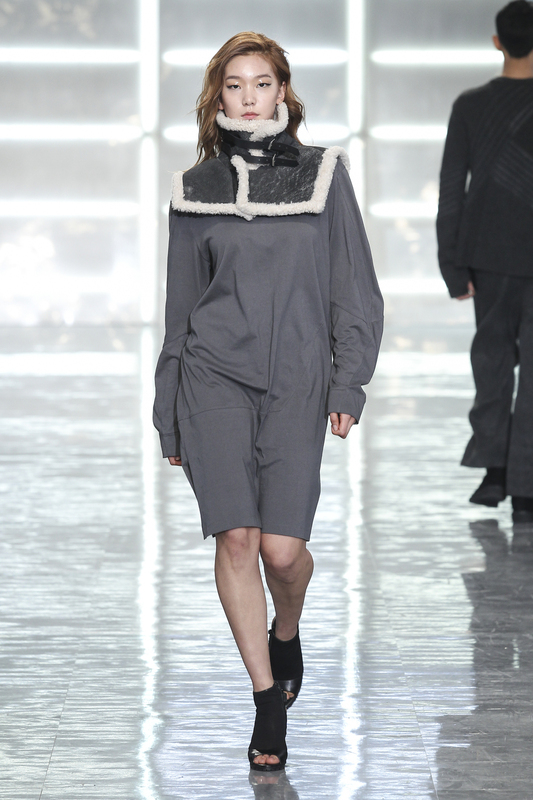 It is no surprise that Seoul Fashion Week maintains a strong collection of designers and shows. They are showcasing excellent work and practical, wearable clothing that evokes emotion, has a strong sense of tradition and history, and uses color and form that speaks fluently to an international market. Seoul Fashion Week is worth paying attention to because ready or not, here the designers come. For more coverage of this Fall/Winter be sure to check out the rest of the fashion week coverage from MUTZINE.